RUNDU – Namibian professional boxer Jonas Matheus successfully defended his International Boxing Organisation (IBO) International bantamweight title at Rundu on Saturday. Matheus squared off against Nasibu Ramadhan of Tanzania during the Salute Boxing Academy Kavango River Fray Boxing Bonanza. To retain his title, the Namibian boxer pulled out all the stops as his Tanzanian opponent refused to budge to an onslaught of punch combinations, lasting the full 12 rounds the bout was scheduled for, and losing only on points. In other bouts on the night, heavyweight boxer Kasera Sirongo made his professional debut, in which he recorded a second- round technical knock-out against Johannes Nangolo from the Kilimanjaro Boxing Club. Sirongo, who looked rusty in the first round after a scuffle with Nangolo, started using his jab in the second round as instructed by his corner, forcing his opponent’s corner to throw in the towel after just two minutes and 53 seconds of the second round. In a super flyweight four-round bout between Shonena Paulus and Thomas Ndeitunga, the referee was forced to stop the fight in the fourth round after Paulus unleashed an onslaught on his opponent. 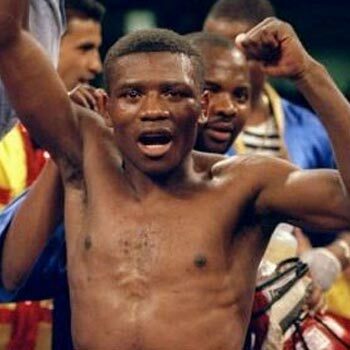 The welterweight bout between Bernard Bernard and Kristof Iipinge was a no-contest after Iipinge, who was making his professional debut, dislocated his shoulder, forcing the ring doctor to put an end to proceedings. Japhet Amukwa defeated Nangolo Samuel with a fourth-round technical knockout in their bantamweight fight, while Ruben Kandimba ousted Theodor Nujoma on points after four rounds of boxing in their flyweight bout. The only draw of the night was in a fight between John Shitilitha, also making his professional debut, and Julius Sheetheni. A six-rounder super bantamweight bout between Costa Nilo Frans and Lazarus Namalambo ended in a unanimous decision, with all three judges scoring in Namalambo’s favour. An eight-round middleweight clash between Alfeus Shilongo and Chris Ukelo saw the former taking the plaudits on points. Nathaniel Kankolola was on fire on the night as he knocked out his Malawian opponent, Robert Kachiza, in the fourth round of their featherweight bout.